The Rocky Timber Trail Riders or RTTR is an off highway vehicle club located in Northwestern Illinois. 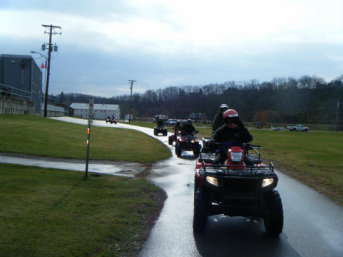 We are committed to promote recreational OHV riding that is safe, a public image of safe riding and the benefits of recreational riding to the public. We will also strive to develop good relationships with other OHV organizations, businesses, and government agencies. We are actively involved with keeping current trail/routes open and exploring new opportunities! After years of being both being ATV owners and enthusiasts, the thought finally dawned upon Nick Keleher and Pat Quinn that while riding alone or with only a few friends can be fun, the old saying "The more the merrier." is most definitely true; not to mention it makes the work load much lighter. Upon this brilliant breakthrough the Rocky Timber Trail Riders or RTTR was formed. We are just a couple average Joe's who enjoy riding together. So we thought it was time to expand. After all, there has got to be more than just a few people in our area who enjoy ATVing just as much as we do. If you do not wish to join but would like to help us is our goal to have recreational OHV trails in Illinois please click below for your monetary donation. Please Navigate to the Membership page for online submission or Send us an email and we'll send you a membership packet. If you dont have email, please include your address to send it to. Patterson Sales & Service LLC are giving anyone who mentions that they saw this ad on Facebook, the Website, or by email 10% off of all services and sales until July 1st, 2014. Please contact them at 815-541-6019. Donations to RTTR are not tax deductible as charitable donations.